Seeking to reduce road traffic, officials at Logan International Airport will spend $15 million to design and study the feasibility of a transit line that would ferry travelers to and from terminals, the MBTA’s Blue Line, economy parking lots, and the car rental center. 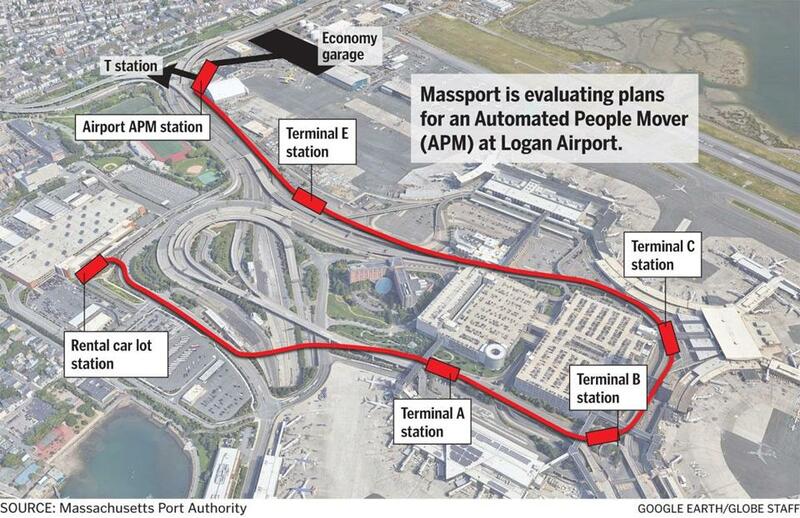 The Massachusetts Port Authority, which runs the airport, is planning to hire a consultant to advise it on building an “Automated People Mover” similar to the trains or monorails in use at many other busy airports around the world. The idea grew out of a proposal in 2015 by Massport to build a moving sidewalk between the Airport Station on the Blue Line and Terminal E, where the numbers of international flights and passengers have surged. Massport’s chief executive, Thomas Glynn, said it now sees a transit line stopping at each of Logan’s four terminals as a more comprehensive solution. Massport officials cautioned it would take at least 10 years for such a system to get up and running, and that it could cost $1 billion or more. If the study concludes the project would be too expensive or could not be squeezed into the crowded confines of Logan, Massport would reconsider a moving sidewalk or walkway, Glynn said. Another option would be to build a small transit connection between the T station and Terminal E.
The people mover would be a dramatic change for public transit at Logan. Today, one branch of the Silver Line runs from South Station to Logan, stopping at each of the airport’s terminals. Passengers arriving via the Blue Line or the new Silver Line service from Chelsea must connect to shuttle buses and then travel a half-mile or more along Logan’s crowded roads. A tram-like line would essentially replace the shuttle buses from Airport Station, providing more frequent and faster service, because it would be separated from Logan’s roadways. That could attract passengers who would prefer taking trains instead of buses to the airport, said Seth Young, an aviation professor at Ohio State University. Los Angeles recently moved forward with a plan for an elevated people mover that would stop between terminals and at a transit station. The price tag is about $5 billion, but includes 25 years of operations and maintenance, according to The Los Angeles Times. More than a dozen other US airports have these kinds of transit systems, as do several others in major cities abroad. Some are used primarily to ferry passengers between terminals, Young said, while others are designed primarily to get cars off airport roads. 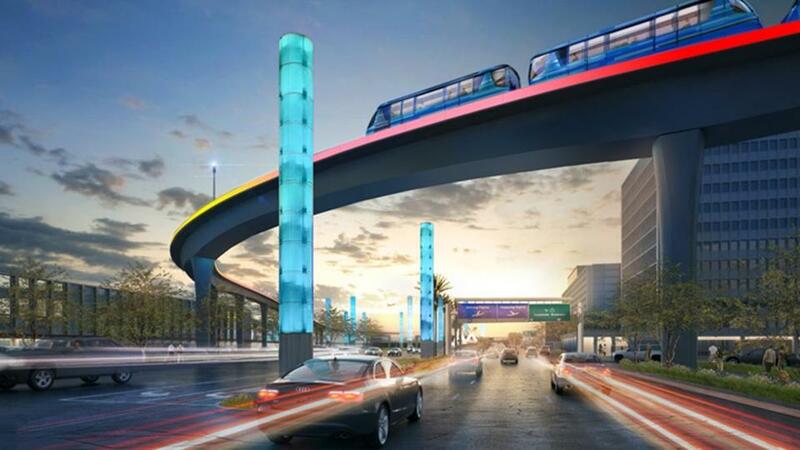 A rendering of the proposed people mover system at Los Angeles International Airport. At Logan, Glynn said, the primary idea behind a people mover would be to reduce traffic congestion. Most passengers get to Logan by car; only about 30 percent use public transportation or some other type of high-occupancy vehicle, according to Massport data. After Massport opened Logan to ride-hailing companies, Uber and Lyft overtook taxi cabs in a matter of months as the most popular way to get a ride out of the airport. Congestion at Logan has gotten so bad that Massport briefly studied — but rejected — the idea of an entry fee for cars. Under an agreement with the Conservation Law Foundation, Massport is obligated to increase the number of passengers who arrive at Logan in some form of high-occupancy vehicle to 40 percent by 2027. The people mover proposal is unrelated to that agreement, but CLF vice president Rafael Mares said that, if enacted, it could help Logan meet or exceed that goal. Glynn said a tram or monorail system at Logan was not seriously considered before because of “spatial constraints” at the relatively small airport. But a few years back Massport committed to a direct connection between Terminal E and the T’s Airport Station as part of an upcoming expansion of the terminal, either by moving sidewalk or walkway. While reviewing those ideas, officials began looking into whether a people mover would be possible and were encouraged enough to plan the larger study. The study will be more comprehensive than simply determining whether such a project is feasible, Glynn said. In addition, it will knock out significant design and planning work should the project move forward, he said.